Happy Valentine’s Day! Share the passion you have for writing articles using this free Article Template! Facts are waiting for anyone to pick them up and share them with others. However, facts are just facts without connection and enthusiasm. It’s your conviction, your belief, your immeasurable feelings, and your passion that compels your audience to stop and listen. It’s for that reason you can positively electrify your writing by sharing your passion and connecting readers to the facts. Give it a try with this article template! Open with a great hook relevant to your topic: a quick anecdote that illustrates a story (dilemma or otherwise), a surprising statement that evokes interest, or a scene that places the reader in the future (either if they do or don’t become passionate about XYZ). Provide a list of reasons why your audience should be passionate about your topic. Consider WIIFM (what’s in it for me)? Why is it relevant to your audience and how does it benefit them? Begin each point with vivid power words that charge up your reader and motivates them to act. Share your delight about your topic! What’s the next step? What should your audience do? Tell your audience in a clear and motivating call-to-action with a large dose of passion in your prescription. 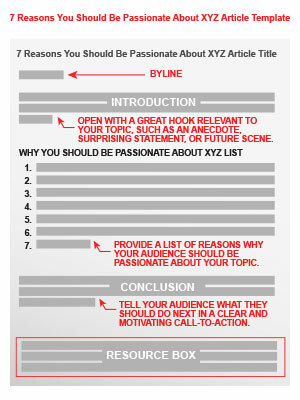 Click here to download this Article Template FREE to begin writing your very own 7 Reasons You Should Be Passionate About XYZ article. Hurry! Our buy one, get one 50% OFF Article Templates Valentine’s Day Special ends on Sunday, February 16, 2014. Click the banner below to get more Article Templates like the one above at the EzineArticles Shop! Yes, thank you for the template! That might actually work for me. My articles normally focus on the ‘How’ of my particular subject rather than the ‘Why’. This could open up an entirely different series of articles. i love this idea, thanks for sharing this template. Thank you so much for your template. I do write article usually using my college years technique, but this simpler. Thank you again. Thanks for the template! I love the info and ideas!